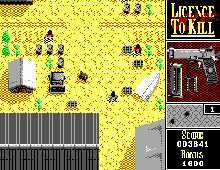 007: License to Kill is a great top-down shoot-em-up based on the movie by the same name that stars Timothy Dalton as James Bond, the world's most famous secret agent. The plot is identical to the movie: James Bond decided to resign from the British secret service (once again) to avenge the death of Felix Leiter, his CIA friend. Bond's target: drug baron Sanchez. The game's hallmark is the excellent level design: each new level is different enough from the last to keep you glued to the screen. You will shoot baddies on foot, battle over Miami bay in a helicopter and even underwater on your way to the final confrontation in gigantic oil tankers. The weapon selection is a little slim, and the game is definitely much harder than average as you are always swamped with enemies, but the game is well worth your time and effort. Kudos to Domark for producing one of the most successful film-based games ever made: in fact, the game is arguably better than the movie. If you are a fan of Ikari Warriors, Operation Wolf, or similar games, you will have a blast with this Bond escapade. Highly recommended! Related Links: Official James Bond web site, Mr. Kiss Kiss Bang Bang!